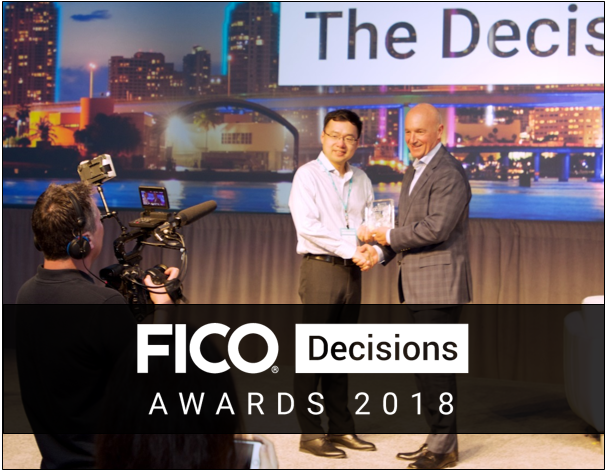 Companies that are achieving outstanding results using analytics and decision management solutions from FICO are invited to submit nominations for the 2018 FICO® Decisions Awards. These awards shine a spotlight on business leaders who are driving their business forward and improving the customer experience using decision automation, optimization, predictive analytics, AI and machine learning. Nominations are due November 14, and winners will be announced in December. Awards will be presented in seven categories: AI and Machine Learning, Customer Onboarding and Management, Debt Management, Decision Management Innovation, Fraud Control, Financial Inclusion and Regulatory Compliance. Winners will receive recognition at FICO® World, which will be held in November 2019. Winning implementations will be featured in conference activities, and two representatives of each winning company will receive complimentary conference passes. Last year’s winning firms were Germany’s Harry Brot / Asolvo (AI, Machine Learning and Optimization); China’s Shanghai Pudong Development Bank (Customer Onboarding and Management) ; The Philippines’ Globe Telecom (Debt Management); Malaysia’s Credit Guarantee Corporation (Decision Management Innovation); Switzerland’s UBS Card Centre (Fraud Control); Latvia’s 4Finance and Britain’s Vauxhall (Regulatory Compliance, dual winners); and North America’s PepsiCo (FICO® Choice Award).